I realized that I’m a totally visual person. That means I can memorize visual things far easier, than written stuff, for instance. E.g. if you’d ask me in Hamburg about the S1, or the U3, I wouldn’t get them right. If on the other hand, you’d ask me about “the green one” or “the red one”, I’d definitely be able to tell you, which way they go, how they move across Hamburg, through which important stations they go, and most probably also, whether station “XYZ”‘s on the way. Gravatar is a web service, that allows you to attach Avatars to your eMail accounts. Thus done, services that make use of Gravatar can fetch the information by providing the eMail address. For instance, on right-hand upper corner you’ll find a Gravatar plugin that, with the help of my provided eMail address fetches the avatar picture I’ve provided on Gravatar. This can be then used anywhere – like when I comment on other blogs. I’ve tried to find a reference, of what services use Gravatar, but I couldn’t find anything. Still, it seems to be a lot of them, because Gravatar claims that there are as for this moment approx. 29,000 requests per second. If you develop web applications, just have a look at Gravatar, there’s a description on how you could use it for your services – pretty simple though. Just create the md5 hash out of the given eMail address, and postfix it to the URL http://www.gravatar.com/avatar/ (e.g. http://www.gravatar.com/avatar/c6a7eed7a63c25cecb50e14d861c9956 and there you go (if you ever test it on your Linux machine, just keep in mind, that echo “email addy” will add a carriage return to the “email addy”. Just spent some 20 Minutes figuring out, why a web service get’s a totally different hash, then my local installation of md5sum. You’d rather need to call echo -n “email addy” | md5sum to get proper results). Just visit Gravatar and find an explanation video as well as some other information besides the possibility to upload your own personal Gravatar. If you didn’t had an Gravatar account, until now you had an “No avatar” icon (see the picture 😉 ). This isn’t the nicest thing to have, so I looked whether there are any alternatives, and actually there are. Three of them come with the WordPress implementation at http://www.wordpress.com (if you actually hosted the workspace source yourself, you’d had even more possibilities). All of them sucked. But as I dislike two of them more than the last one, I decided to stick to that (it’s called MonsterID, originally written by Andreas Gohr, and is availiable for different systems). So from now on, if you don’t have an Gravatar, this Plugin will take care of that you’ll get a unique monster avatar that visualizes you (i.e. unique for this blog). 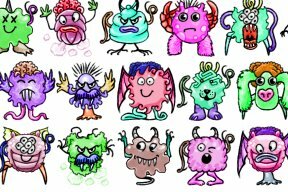 This entry was posted in Blogommunity and tagged avatars, Gravatar, MonsterID, visual memory by pygospa. Bookmark the permalink.